Co-Optimus - News - This Week In Co-Op: Look Behind You! A 3 Headed Monkey! This Week In Co-Op: Look Behind You! A 3 Headed Monkey! I can hear the cries now, "WHAAAAAAAAAAAATT???!! That game’s not co-op! Why don’t you go write for Solo-Optimus!?!" Well, relax those troubled cries for one moment and read on. What follows is not a description of some dude who sat down and played a traditionally single player game. Nay. What follows is a tale of making an old game new again, and a gamer remembering why he began co-op gaming in the first place. 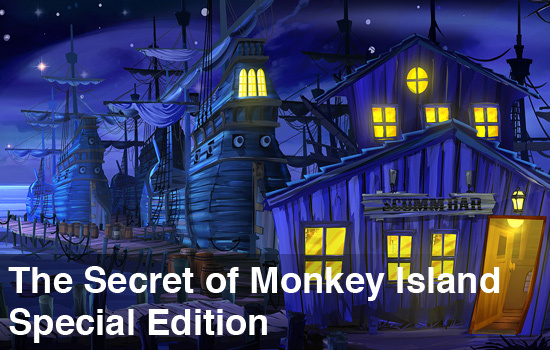 The Secret of Monkey Island, in my opinion, is one of those games that you just have to play if you’re a fan of the adventure genre at all. Amusing dialogue, interesting and colorful characters, and one of the cleverest puzzles I’ve ever encountered make this title easily reside in my top ten games of all time. So imagine my surprise when I discovered that my mom, the person who first introduced me to adventure games, had never played it. This had to be remedied. My mom is a fairly regular gamer and played through almost all of the old Zork, Infocom, and Sierra adventure games back in the day. Although she’s moved from adventure games to platform/action games over the past few years, she still has the adventure gaming chops. Still, from time to time I found myself piping in with a "why don’t you look at that object you just picked up," or "what if you tried combining those two objects" to help out. Now, I’ve played this game so many times I can recite whole parts of it, but I also have always approached it in one way and usually follow a somewhat regular path that involves the most humorous and/or ridiculous dialogue options I’m given. My mom, on the other hand, had a different approach to things; she opted for the most polite and/or courteous dialogue choices possible. Where once there was the character of Guybrush Threepwood, sarcastic and wisecracking pirate, there now stood Guybrush Threepwood, polite and well-intentioned pirate. Despite the fact that the solutions to the puzzles and ultimate endgame were immutable, the journey taken to get there had changed slightly. It was like watching your favorite TV show suddenly throw a curveball at you and turn into something altogether new, yet still familiar. 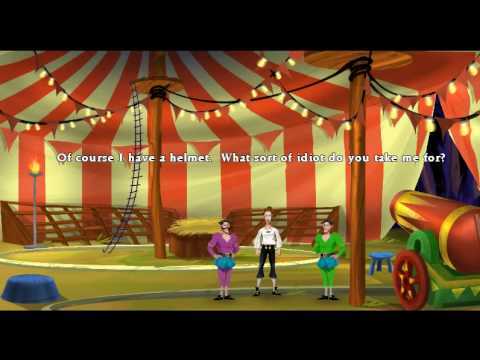 At one point, my mom asked me if the game ends with Guybrush starting a circus. Jason’s Mom: Well, those men we talked with in the streets said they were part of a circus, but their elephant ran away. There’s talk of monkeys everywhere and we’re IN a circus tent right now. I was at a slight loss for words because her interpretation was one that was somewhat feasible, and one I hadn’t previously considered. Why would there be a circus tent in a game about pirates? Suddenly I was interested in the game all over again. I knew how the game ends, and what happens along the way, but in that moment, Guybrush Threepwood was a budding ringmaster. We were working together to not only solve the puzzles, but we were also working together to see how this story would progress; for my mom, that meant just the regular story itself, for me, it was seeing what new ways this story could unfold based on her observations. Traditional co-op, as the term is bandied about, often gets defined as one or more players playing the same game at the same time in a collaborative manner, which leads to a "co-op experience." However, there is a wealth of co-op experiences waiting to be found in many non-traditional co-op games, such as Monkey Island. Part of what makes playing any game with others a co-op experience isn’t just working together to solve a puzzle, clear a level, or beat a boss, but doing so with an array of people that bring different views, ideas and attitudes to the game. Think of more traditional co-op titles like Halo 3 or Left 4 Dead; both would grow stale fairly quickly if every time you played with another person it was the same experience over and over again. It’s the people you play with and all of their quirks that help make for a memorable co-op experience, and I became so enamored with co-op gaming because of experiences like this one. When playing through Monkey Island, my mom’s experience was one of playing through an adventure game with her son, much as we did when I was just a wee tot. For me, I experienced a game that I had played countless times over in an utterly new way. The reward in co-op gaming is not always measured in achieving some goal, but in the shared camaraderie and the new escapades you experience along the way. I’ll close this article with one last tale from our play session. At one point in the game, you need to get a line of credit from a shopkeeper; however, the shopkeeper only gives credit to folks who are employed. How did my mom approach this situation? She forthrightly admitted that she was currently unemployed. Jason: Why did you tell him you don’t have a job? Jason’s Mom: Because I don’t have one. I need to get one. Jason: You’re a pirate. Think like one! ...Besides, who would employ you?